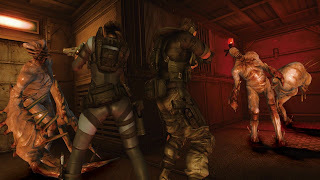 Capcom confirmed that Resident Evil Revelations will be coming to Xbox 360 PlayStation 3, Windows PC and the Wii U on May 21st as a retail package. The game will also be available to download Day-1 for PS3 and PC, with the 360 and Wii U versions releasing a downloadable version shortly after. Revelations was originally released for the Nintendo 3DS, and received great reviews from reviewers and consumers. This new release of the game will contain upgraded HD visuals, new content in the form of a new enemy to face, an extra difficulty mode and and the opportunity to play as Hunk and other characters from the series. The game's Raid Mode will be playable online so you can invite a friend for some co-op action. Revelations will cost $50 when it releases in May.